The Taj Mahal Hotel, New Delhi, is currently hosting a Swiss Culinary Week and has three chefs from the 150-year-old Hotel Beau Rivage Palace in Lausanne, Switzerland, to prepare and serve gourmet delights from Switzerland. We met the sous chef Guillaume Salas, a passionate cook who had been working in the kitchen since 8am that day, making sure everything was perfect. Is Swiss cuisine unique or is it a part of the larger European cuisine banner? There are influences from France, Germany, Austria and Italy. For instance, the accompaniments are borrowed from the neighbours. The smoked duck breast carpaccio goes well with an apricot chutney from Valais, a place well known for apricots. And yes, chutney is a familiar word in Switzerland. However, the higher up you go in the mountains, the more authentic the food gets. Cherry alcohol called kirsch is typical to Swiss cuisine. Is cheese integral to Swiss cuisine? Fondue and raclette are popular dishes; both are basically cheese. One may think that dairy is good quality there, so the by-products are naturally essentials in the cuisine. It’s also the weather that makes Swiss cuisine rich in cheese. It gets very cold and after a vigorous skiing session, we have big appetites and cheese makes for a warm, filling meal. How important are the holes in the cheese? (Laughs!) Not at all actually. The holes make no difference to the taste or quality of cheese. In fact, Gruyère cheese has no holes, it’s only Emmental cheese that has the characteristic eyes. They happen as a result of fermentation. It’s just air. No mouse has eaten the cheese. Are there any cheese rules that we should know about? While eating heavy-cheese meals like fondue, you shouldn’t have cold water or drinks like Coca-Cola. If you do, then good luck with digestion. Cold water doesn’t go well with melted cheese. On the other hand, wine is good. The alcohol helps to break down the cheese. Is there any street food in Switzerland? No, not in the same sense as it is here in India. It’s so extensive here, and I love hot food so I quite like Indian food. A quick Swiss snack is the pan-fried fish along Lake Geneva, but that’s hardly street food. What’s a popular Swiss dessert? That would be strawberries with double cream and meringue. It’s a common sight in Switzerland to see people sit on their terraces, under a warm sun and enjoy some strawberry and cream. This simple cheese crust is a regular meal in Switzerland. Take a baking dish. Place the bread in it and pour the wine over it. Soak the bread in wine and then lay the ham and cheese on the bread. If you’re vegetarian, you can use slices of tomato, zucchini and aubergine instead. Bake for 8-10 minutes, at 180 degrees Celsius, till golden brown. 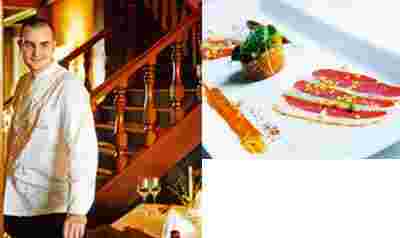 The Swiss Culinary Week at Machan, The Taj Mahal Hotel, New Delhi, ends on Sunday. A two-course meal for two costs ₹ 3,000, plus taxes.